Our bedroom has been a work in progress since...let's see...always! You can check out this post about its past lives. I wrote that post practically a year ago, and it hasn't changed much. I've been trying to do a better job at shopping intentionally and having a clearer picture of what I want--instead of ooh-this-looks-cute purchases that never get used. I had been wishing for a pair of lamps and a velvety pillow--and you know what, during my last thrift store visit, I found just what I was looking for. And they were actually in my price range! I'm learning the art of waiting for the kill and avoiding unnecessary purchases. Purchasing the lamps and the pillow got my wheels turning again about my bedroom vision. The lamps that I picked up at the thrift store are pretty similar to this one seen on Apartment Therapy. I'm also definitely wanting to make my own doily pillow, but I think I may choose a different color. This white table looks pretty close to the ones we already have. This basket from Crate and Barrel is perfect for holding our extra blankets and quilts (the chair we are currently using for holding blankets isn't serving its purpose too well...it's just a big clothes magnet). I love vintage linens and I'm thinking about doing coordinating, but mixed and matched, vintage linens on the bed. This set of pillowcases on Etsy are so darling :) Although the set is sold, I'm on the hunt for something similar! Even though our room would be just fine without a rug, this rug from Pier1 caught my eye. The brown linen is about the same color as our headboard. 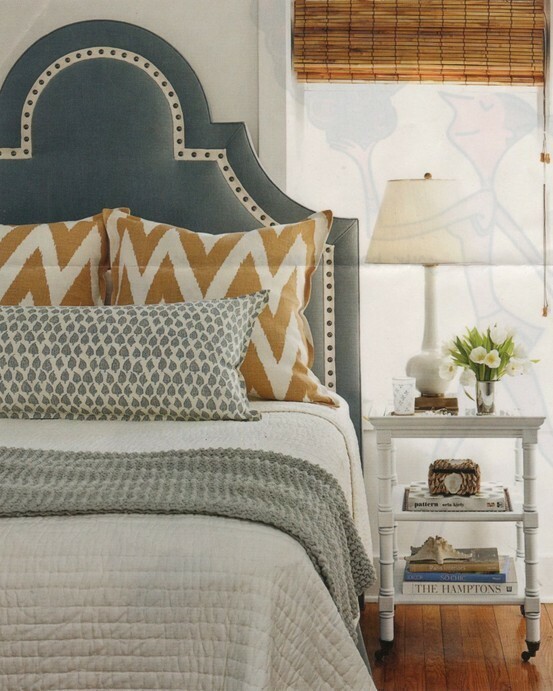 I'm loving this Behr color--a nice blend of blue and gray. 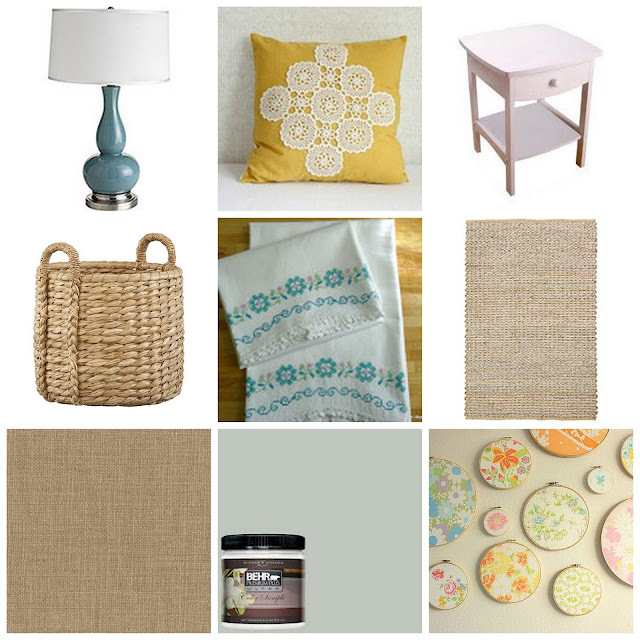 I'm loving the browns, blues, grays, and little pops of yellow. It seems that no room in our home can escape from a pop of yellow! After looking at photos of bedrooms on pintrest until my eyes were blurry, this image was the one image that stuck in my mind. I absolutely love the colors in this room! i love where this is going! so pretty and whimsical!